I have some trousers for Salva to alter and a fitting on Saint Crispin’s – both pretty exciting. 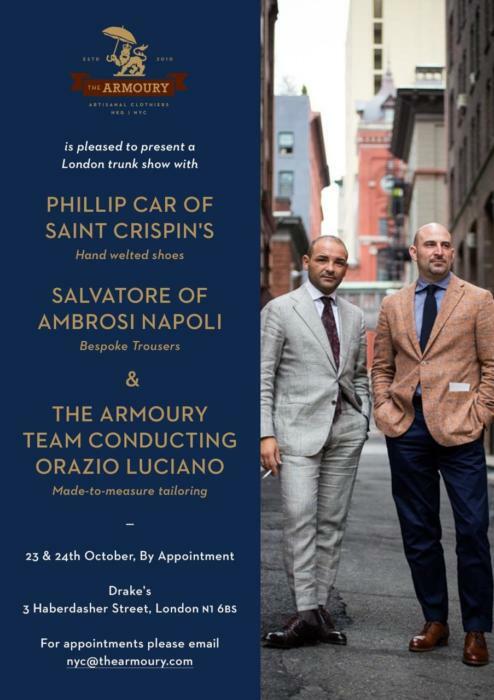 Check out the opportunity to see Orazio Luciano as well, with Jake from the Armoury in attendance. You can read more about Orazio Luciano in my piece here. You can follow the discussion on Salva and Philip in London this week by entering your email address in the box below. You will then receive an email every time a new comment is added. These will also contain a link to a page where you can stop the alerts, and remove all of your related data from the site. Crispin’s mmmmm…. : ) Can’t recommend them enough. Looking forward to the seeing the outcome as I am contemplating my next pair (probably a boot) in the works myself. Who is your “other Neopolitan maker” for pants? Curious to know, as I’m busy laying contacts for jackets, have already a shirtmaker but no pant maker yet. SC may well be at the apex.